What is Kings of War: Vanguard? Over the next few weeks we are going to be delving deep into the world of Kings of War: Vanguard. We’ll be covering how to build your warband, power dice, special abilities, the different factions, campaigns, advanced spells… the list goes on. 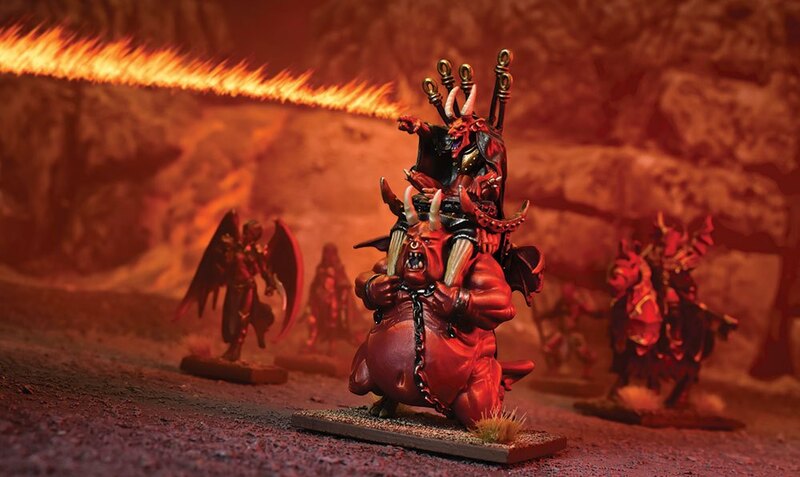 Basically, if you’ve got even the slightest bit of interest in Vanguard and Kings of War, make sure you keep coming back to the blog every day to get the latest info. However, before we do all that, it’s important that we give you an overview of what Vanguard is. You can also watch Ronnie getting very excited about Vanguard in the video below, however, it’s always good to have an overview in blog form too. If you’re already excited about vanguard, check out the pre-orders below. Well, that’s a good question, imaginary blog reader. 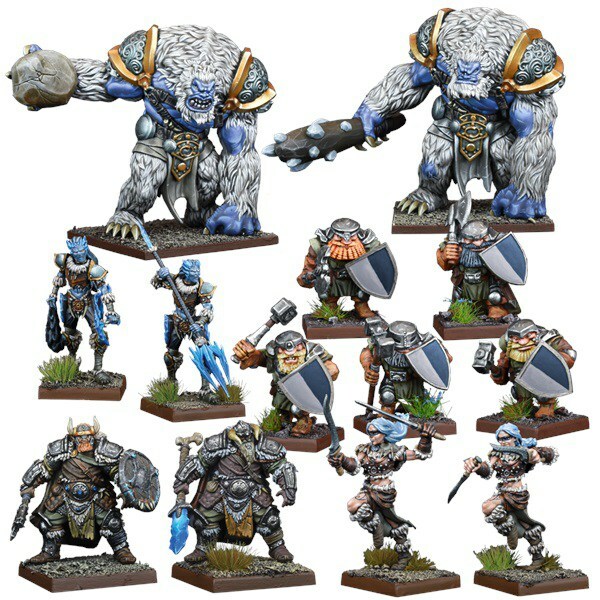 Vanguard is a fantasy skirmish game that ties into our hugely popular Kings of War mass battle game. It’s set in the world of Mantica – a fantasy realm that’s full of powerful magic, towering monsters, warring factions, brave heroes and wicked villains. Of course, we know there are a number of skirmish games out there, so with Vanguard we tried to do something a little different. Rather than being set in a ruined city or specific location, Vanguard battles can take place anywhere across Mantica. One minute your warband can be duking it out on the plains of the Mammoth Steppe, the next they’re in the shadows of the Forest of Galahir and then they’re heading to the Twilight Glades. The reason for this is that Vanguard is focused around the elite troops sent ahead of the main army. These are the handpicked fighters that have been carefully selected to disrupt the enemy’s supply lines, light the warning beacons to show the way or even capture a particularly powerful giant that can be used in the war ahead. Each of these action-packed missions is told through the 12 scenarios included in the rulebook. Even better, each of these scenarios has its own hook to tie into larger Kings of War games… something we’ll cover in a future blog. These are the brutal battles before the armies clash. The desperate struggles to gain the upper hand. If you can win these ruthless skirmishes, then victory will be yours. Oh, you’re back again Captain Questions. So, we realise that ‘skirmish’ is a term that can mean a wide range of game sizes. 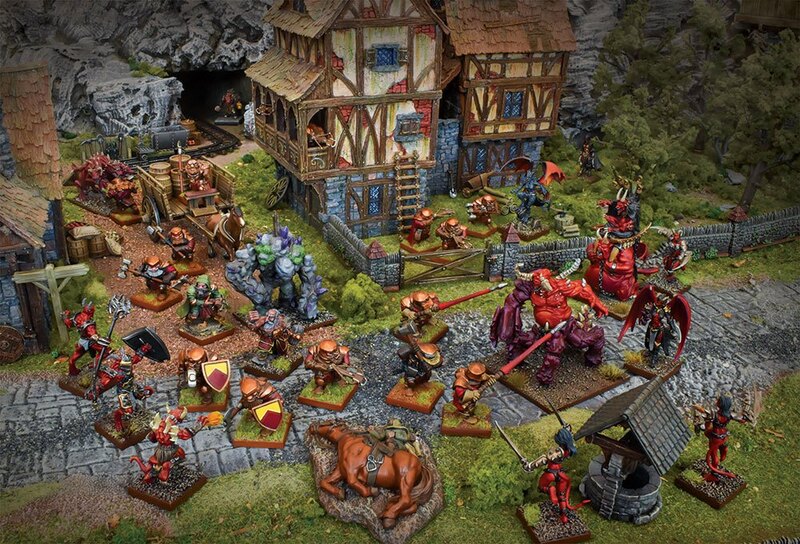 You’ve got something like Deadzone, which typically uses around 10 miniatures and is a classed as a skirmish game. However, there are also games like Firefight that use about 30-50 miniatures but are also seen as skirmish games. 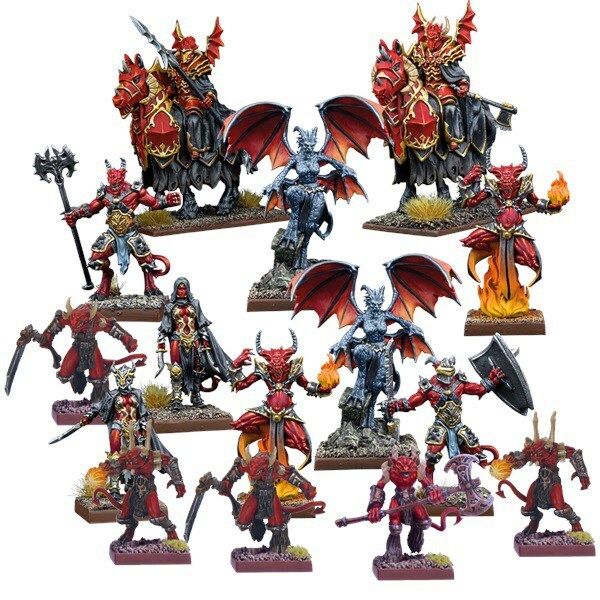 In Vanguard a 200 points warband will typically consist of around 9-12 miniatures, and is the standard size for games. 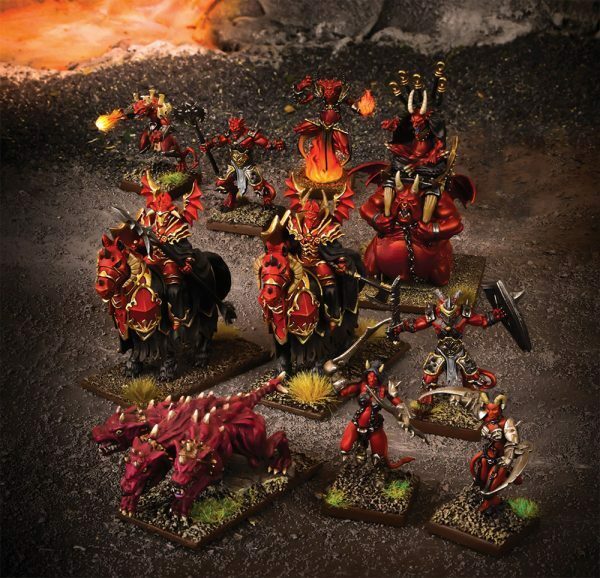 You’ll have your leader, grunts (the low level troops), warriors and then a mix of support units, spellcasters and a large model. Once you’ve selected your troops, you can also give them different equipment to help boost their abilities. 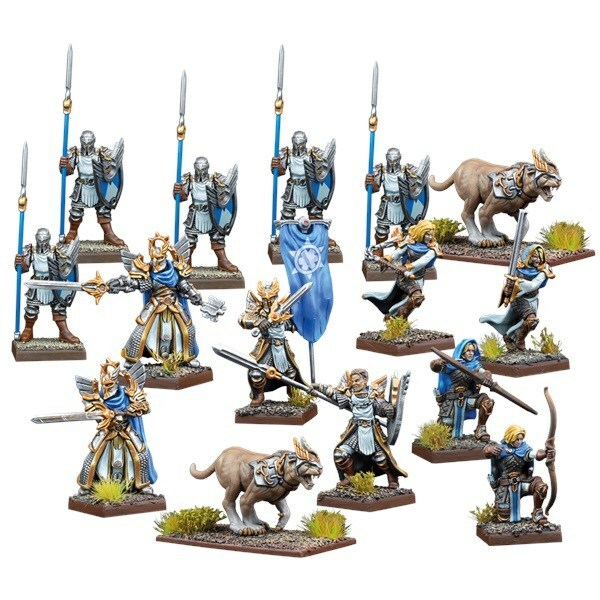 This means it’s extremely easy to get a warband painted up in a short space of time – particularly when compared to the amount of time required to get a Kings of War army ready for battle. However, if you’re planning to play in a campaign then you’ll have 400 points to create your ‘company’ of fighters. Then during games, you can draw from your larger company to choose the units and equipment you want to send into combat. By performing well, fighters will learn new abilities and you can even assign them special roles that will shape how they develop across the course of a campaign. We’ll be covering campaigns in greater detail over the course of the next few weeks. What’s more, we’ll be introducing the various warbands created by staff here at Mantic, then following their progress through a series of blogs. CAN I USE MY KINGS OF WAR MINIATURES? Yes, you most definitely can. Oh, you want a more thorough answer than that? Ok! When we were designing Vanguard we always knew that we wanted it to complement our existing Kings of War range and also bring entirely new units into the game. Each of these starter lists contains eight units for you to choose from when creating your warband. They’re a great introduction to the game and you can most definitely use them in a campaign or one-off games. Also, these warband lists all feature miniatures that we currently produce. If you’re a goblin player, it’s more than likely you’ve got a Wiz, Biggit, Spitters and a few Rabble kicking around, so you’re good to go in Vanguard. Hooray! When we do a full warband release – like the launch releases of Nightstalkers, Basileans, Forces of the Abyss and Northern Alliance – we’ll introduce more model options to fill out that initial starter list. These will be supplied via warband cards in the faction sets and faction boosters. We’re confident this is a great way to bring new and exciting models in the Vanguard range. Even better, we can create new Kings of War entries based on these miniatures too. These may be introduced into the Kings of War rules via the annual Clash of Kings release. So, as you can see, right from day one we want the two game systems to work together. If all this has tickled your gaming fancy, then pre-orders are live now on the Mantic website. 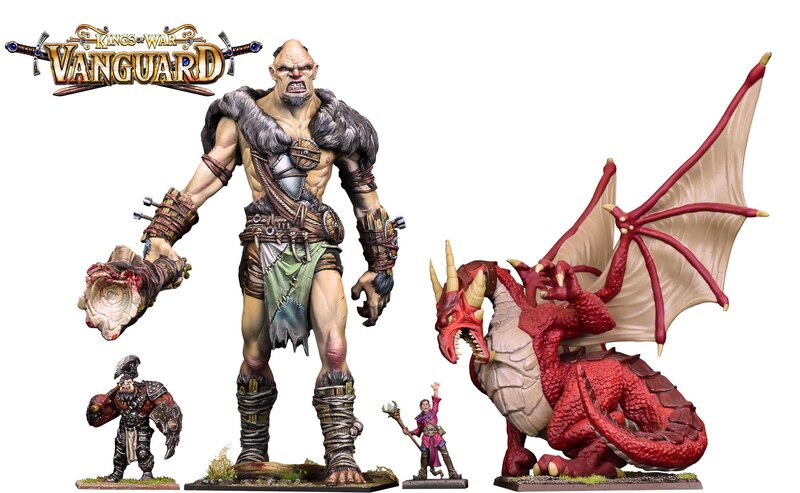 What’s more, we’ve got a limited early release for the massive 180mm tall fantasy giant. The official release for this is January next year, but we’re making a handful available for release in late October. We’re expecting this bad boy to sell out fast though! Alongside this, there are new faction starter sets for the Nightstalkers, Basileans, Forces of the Abyss and Northern Alliance. With the Gods’ blessings, the Basileans are a shining beacon of hope against the encroaching darkness in the world. Pious and brave, they are ready to fight the evils of the world through fire and faith. The demonic forces of the Abyss serve their imprisoned masters in the mortal world. Small incursions of cackling Lower Abyssals and vicious Succubi lurkers often precede a full invasion. Wielding fire and fury, they bring destruction to Mantica. An alliance of outcasts hailing from the frozen north and united by a common purpose. Northern Alliance warbands include a wide variety of soldiers, from half-elves and ice Naiads to the lumbering snow trolls. 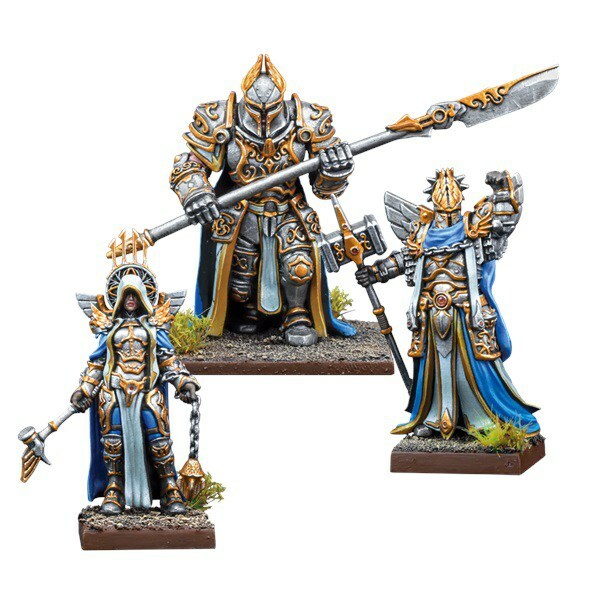 Once you’ve grabbed the faction starter, why not pick up a booster to expand your warband? 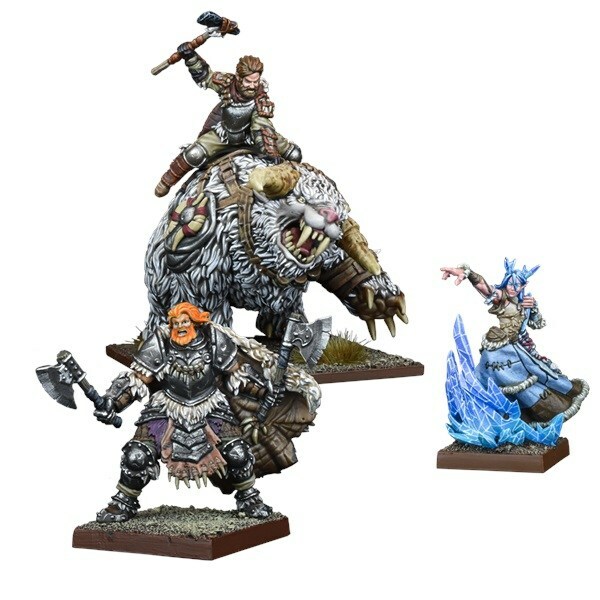 The boosters feature incredibly detailed, handmade resin miniatures, plus extra warband cards for your chosen faction. As Ronnie mentions in his video, we want as many people as possible to start playing Vanguard. With this in mind, we’ve got a very special offer. 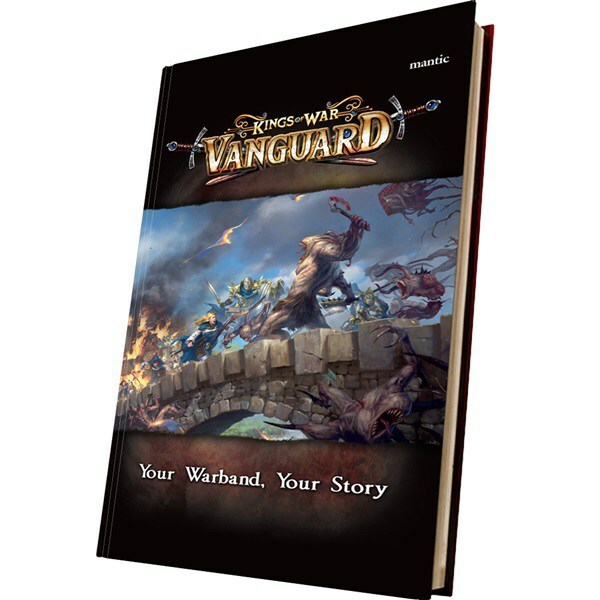 Until October 27th, the hardback 160-page Vanguard rulebook is HALF PRICE. There are also some special bundles to buy the rulebook, dice and scenery, so you can start playing straight away. Check the website for details. Phew… that was a heck of a blog post! Tune in tomorrow for a detailed look at the Vanguard stat cards. 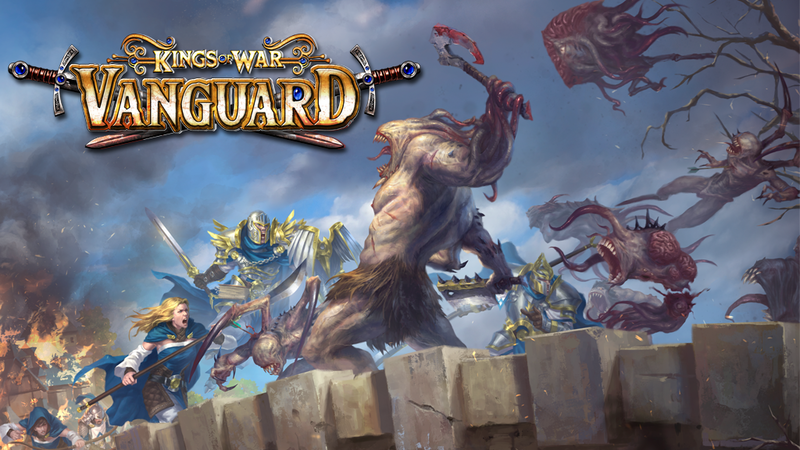 The post What is Kings of War: Vanguard? appeared first on Mantic Blog.